IROW and its NAID certified processes provides customers with the legally required due diligence for data destruction services. Hard drive disposal, including those from redundant obsolete computers, retired servers, and photocopiers is secure with Hard Drive Destruction Services. Why choose IROW Hard Drive Destruction? If your hard drive isn’t professionally destroyed you are risking a lot of data! As a NAID certified service provider no one in the computer recycling and reclamation industry has a better documented certification and qualification process than we do. Modern hard drives have changed little in the last 5 years. A degausser with sufficient field strength will make data stored on hard drive platters unrecoverable by any means. The magnetic particles are completely randomized and there is no partial orientations of magnetic alignments. 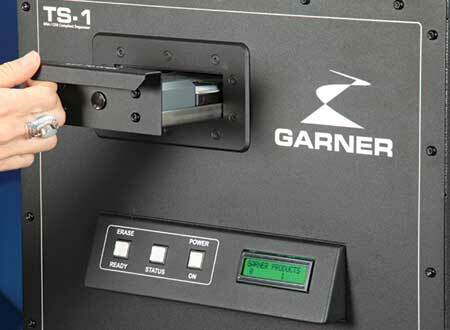 Garner commercial degausser and NSA listed degaussers all eliminate data. 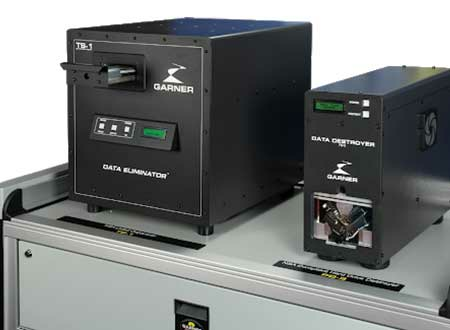 NSA listed degaussers offer significantly more margin for error or changes in technology. *Solid state drives and cell phones cannot be degaussed, but are securely destroyed by piercing and crushing their microchips. Reduce your liability by getting rid of that stockpile of old hard drives! Call IROW today to schedule our onsite media destruction service. We will bring our equipment to you – never breaking the chain of custody – and provide you with a Certificate of Destruction for your compliance records.